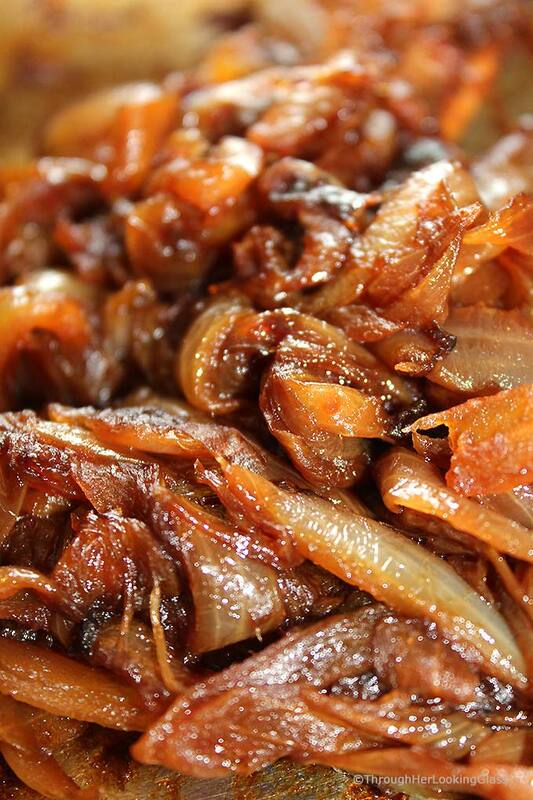 Caramelized onions are sweet, flavorful and oh so addictive. 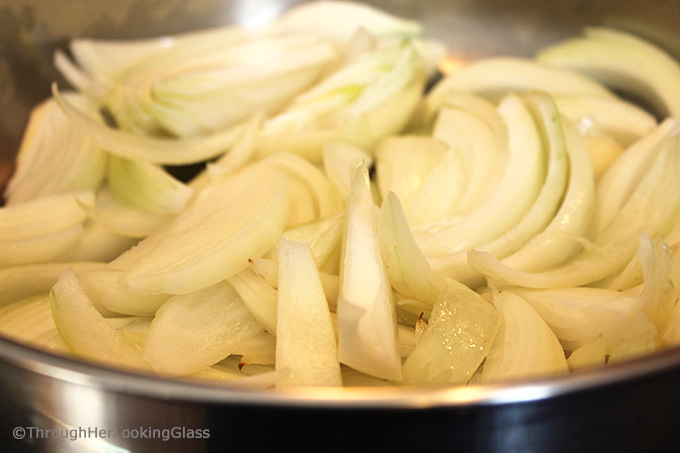 Today I’m sharing easy directions for How to Make Caramelized Onions. They’re easily made in a skillet on the stovetop and take just a few ingredients. Sweet caramelized onions jazz up salads, soups, sandwiches and burgers, pizza, pasta and appetizers. 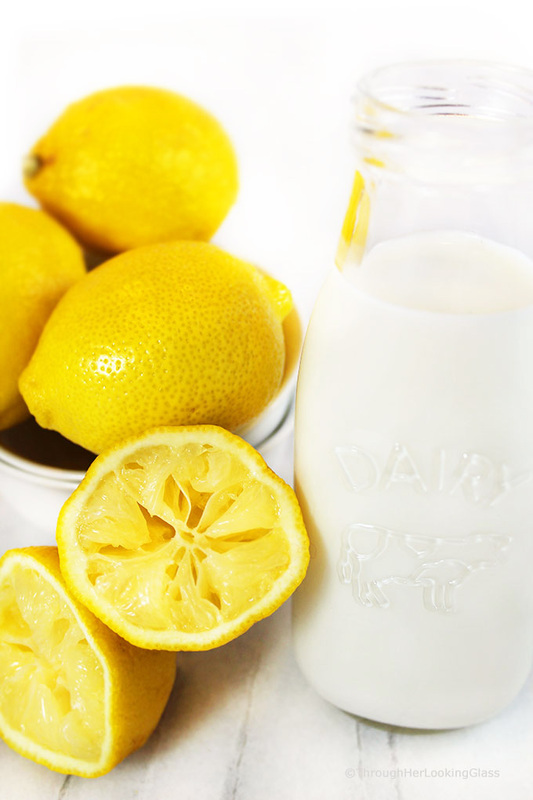 Packed with natural flavor and oh so delish! Leftovers refrigerate or freeze beautifully. If you follow along here, you know we’re in the middle of a major kitchen remodel right now. Things are coming along well and cabinet installation began this morning. I wasn’t sure if I’d even be able to post this week with all the chaos, so last week I whipped up a batch of these yummy caramelized onions to share. They were so easy to make. I mounded the warm caramelized onions on a melty brie round. We dipped crackers and veggies for an easy, impromptu appetizer with a glass of white when Jon got home. Stir butter, olive oil and onions together. So just go slow and let the onions brown on the bottom for a few minutes in between stirring. Then scrape up the onions and yummy baked on caramelized bits each time you stir. Some humorous things have happened during our kitchen remodel this week. It’s totally like tent camping, and I’m not exactly a camper. Or a good one anyway. Scrounging to find the saran wrap and foil, baking soda and salt. Digging through boxes and bags piled high on the dining room table to find the mac and cheese box. Searching in vain for the elusive cord to the electric skillet. (Grrr…) Attempting to wash a large salad bowl in a microscopic downstairs bath sink because I’m too lazy to walk upstairs to the guest bath tub one more time. It’s been an adventure living without an oven, cooktop or kitchen sink for days on end! The funniest thing that happened so far this week was seeing one of our contractors attempt to connect his phone to blue tooth using Hudson’s speech device. SO FUNNY. I think he thought it was an i-pad. Priceless. 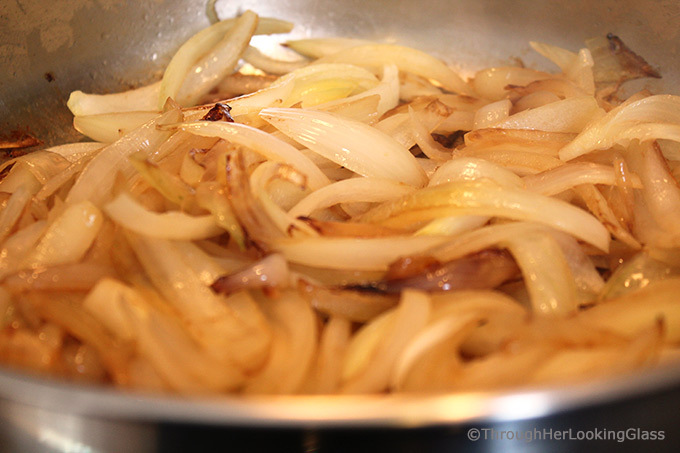 Go slow – take about 30 -45 minutes to caramelize onions on the stovetop. Medium heat seems to work the best. Add a splash of balsamic vinegar at the end for extra flavor. You can add a little pinch of sugar if they’re not sweet enough for you. I don’t usually do that. 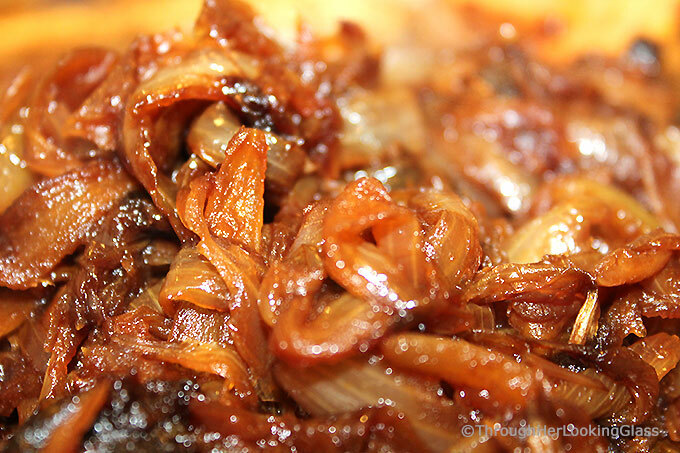 If you have extra caramelized onions – lucky you! They refrigerate or freeze beautifully. 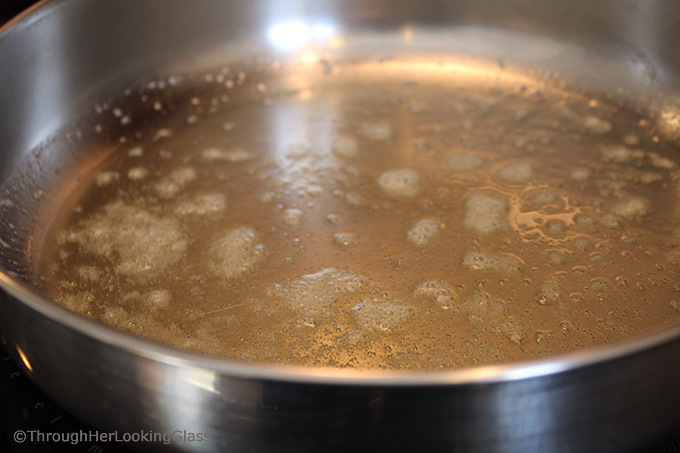 Heat butter and olive oil on medium heat on the stovetop in a large frying pan until sizzling. Add onions and stir well to coat. Cook for 2-3 minutes, then stir. Allow the onions on the bottom of the pan to brown well, but not burn. Then stir again, scraping up all the dark bits formed on the bottom of the pan each time. 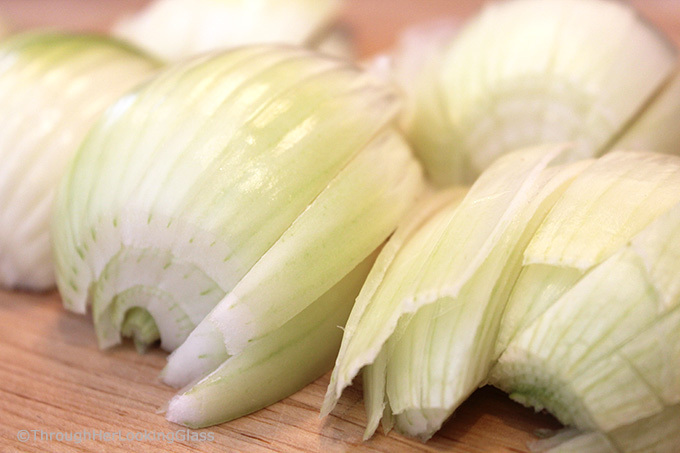 When onions become dry, add a little bit of water - several tablespoons at a time. Keep doing this, for 30 - 45 minutes, or until you have deep, dark caramelized onions. Optional: add a pinch of sugar to sweeten if needed, or a splash of balsamic vinegar for extra flavor. 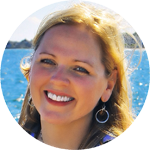 Ooh, I love the idea of balsamic vinegar at the end! Can't wait to try that. Oh Barbara - I'm so happy for you re:the floors, you're making great progress. Our cabinets are about half-way in. I was hoping we wouldn't have to refinish the floor, but it may be unavoidable. Construction is so messy. Yum! You're certainly challenged to cook without a kitchen!! What a pioneer!